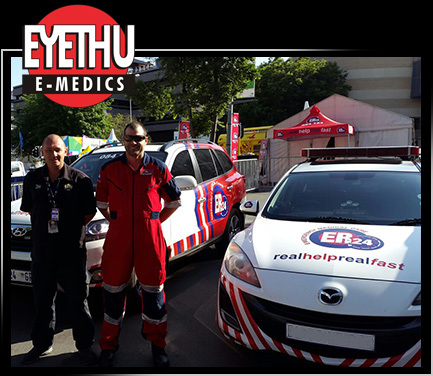 Eyethu e-Medics has signed a long-term Service Level Agreement with ER 24 that will deploy medical staff and resources during events and exhibitions, including the build-up and strikeout periods. Our agreement with ER 24 enables us to deploy both Ambulance and Paramedical staff up to Advance Life Support and qualified Doctors Nationally and into Africa. Each event is assessed in terms of fulfilling not only the client's requirement, but also the Government requirement by law. All Medical Service deployments are based on international accepted Medical Risk Matrix.